The drapes and bunting are just about done. A few adjustments to some of the bunting and that will be it. The bunting is sewn to the drapes and the drapes attach to the wood with velcro strips, so installing and removing them is easy. I also painted the valance and fascia of the non-staging sections. We still need to figure out how to attach the front panel of the staging section. I think we should make it removable to make storage and shipping easier. Francois Simon selected this blog for a Liebster Award. Thanks. I'm glad you enjoy the blog. I was unfamiliar with the Liebster Award prior to this. 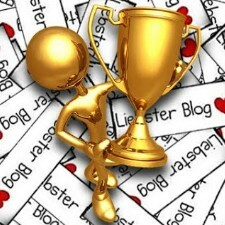 It is a way for smaller blogs to recognize each other. It's not a big deal, but it nice to get an "atta boy" every now and then. One of the rules of the Liebster is for the recipient to pass the award on to their favorite blogs with under 200 followers. I follow a bunch of other blogs and sites. On the left side of my blog you will find a list of ACW RR related blogs. I would recommend those. http://bentobjects.blogspot.com/ This blog has 3000 plus followers, but it is very clever and funny. http://dclawyeronthecivilwar.blogspot.com/ Is a frequently updated blog with research and stories about the Civil War in the Washington DC area. http://tuscarorarailroad.blogspot.com/ Fine scale modeling in the garden. http://cwerailroad.blogspot.com/ Tom Patterson has a very nice layout and blog describing it. http://mattforsyth.com/ Matt's brass engine work is as fine as railroad modeling gets. http://nevardmedia.blogspot.com/ Exceptional modeling and photography of UK prototypes. http://centralvermontrailway.blogspot.com/ Marty's on and off again SNE vs CV layout. The double deck is gone and progress on the single deck CV theme is moving ahead. Hope you enjoy perusing this list. After a fine Thanksgiving dinner, AW, my brother, Marco, and I went to see Spielberg's new movie, Lincoln. We all enjoyed it very much. I knew I would enjoy it, but I was glad my wife and brother did too. I have been doing a lot of research on the Civil War lately, so I felt like I was watching old friends on the screen. This was especially true since the actors look uncannily like their real-life counterparts. The make-up and costumes were absolutely stunning. Daniel Day-Lewis really looked like Lincoln. Even the other actors playing cabinet members were clearly identifiable, especially Seward, Stanton and Wells. Of course the latter two had very distinctive beards so they were easier to get right. This is an important movie in several aspects. First, it will serve as an excellent history and civics lesson for all that see it. It shows how slavery was the key issue in the war. While not everyone in the north supported abolition of slavery, the balance of power between slave states and non-slave states was the issue that led to the war. The scene where Alexander Stevens, the Confederate vice president, asks Lincoln if the rebelling states could surrender and be admitted back to the Union in time so they could have the chance to oppose ratification of the 13th amendment was a key point to me in the movie. To drive the point home, the script has Stevens go on to explain how the South will be economically devastated by the end of slavery. I doubt that he actually said that to Lincoln. I suspect that was there for the modern viewer's benefit in case they forgot. Secondly, it demonstrates how even a greatly revered President has to sometimes gets his hands dirty in leading the country. The exchange between Pennsylvanian Thaddeus Stevens, the Chairman of the House Ways and Means Committee, and the president illustrates the point. T. Stevens argues for unswerving dedication to the moral compass that points toward “True North.” Lincoln counters that this is all well and good, except when your moral compass takes you into a swamp. Your True North doesn’t matter much then. You’re stuck in the swamp." I don't know if this is an actual Lincoln quote, but it is very apropos. One of the reasons I find the Civil War fascinating is that it shows to me that little has changed in Washington and how this country gets things done over the past 150 years. People sometimes say that the nation is divided now as political passions heat up. But it is hard to envision the country more divided than during the 1860s. Movies like this can help calibrate the significance of issues that divide our political scene now. As you can tell, I really enjoyed this movie. 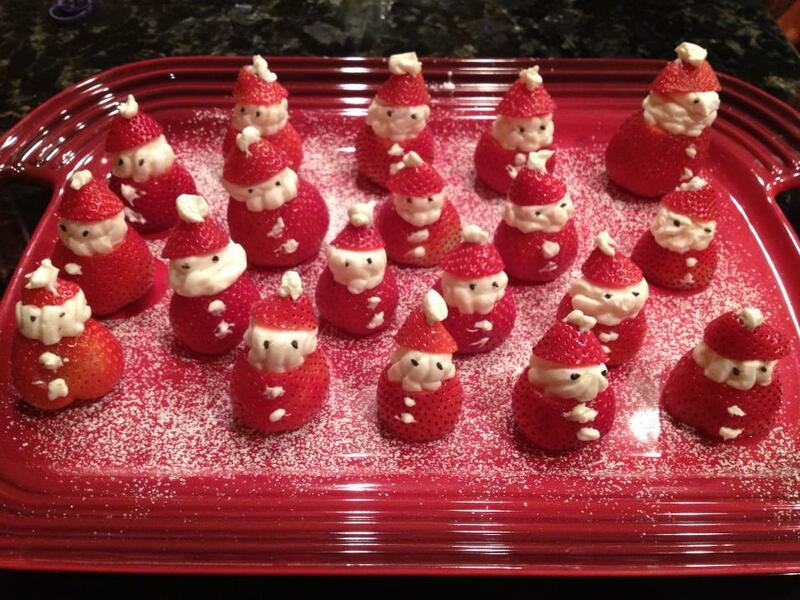 But, there were a few disappointments. 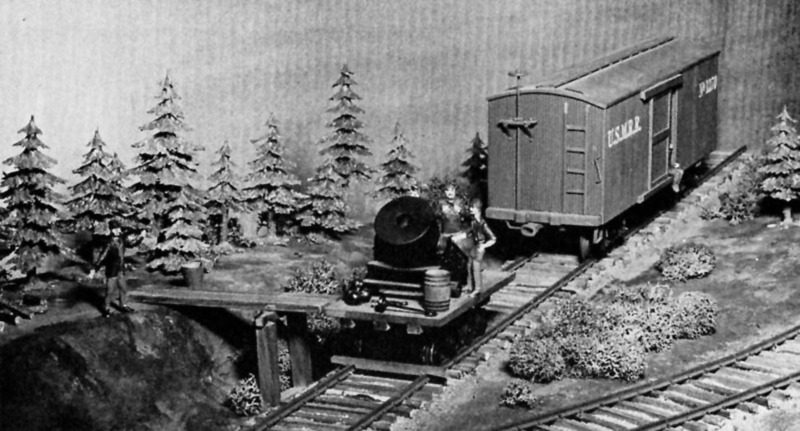 First, as this is a model railroad blog, I am sad to report that there was no scene in the movie showing period railroads. 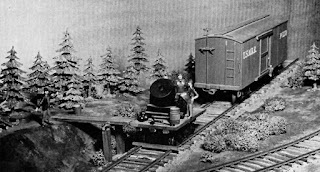 The only train I could detect in the movie was a panning shot of one of Tad's toys, a wooden locomotive. However, the steamship River Queen gets several key scenes. They appear to have built a full sized prop depicting the ship, so they might as well have used it. Some of the street scenes in Washington were well done. The scenes depicting the burning of Richmond were brief and not explained.Perhaps it was an allegory for the overall end of the Confederacy. But, I think the film missed a great opportunity when it failed to include a scene showing Lincoln visiting the burned city after the Union Army occupied it and the freed slaves' response as he moved about. Instead there is a scene where Lincoln rides through the trenches of Petersburg. 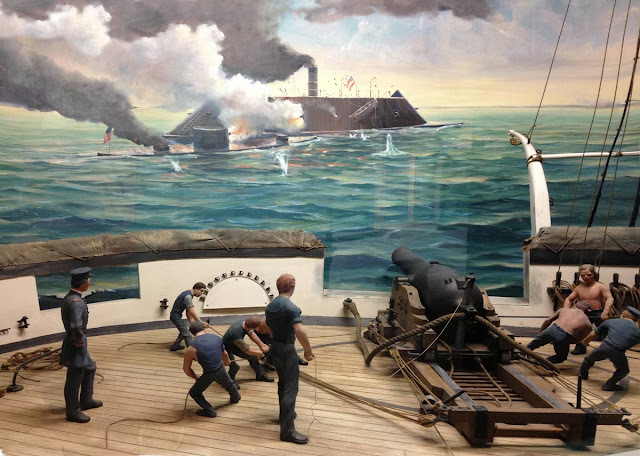 It was way over the top and unrealistic, as was the initial battle scene allegedly depicting the Battle of Jenkins Ferry. As historically accurate battle scenes both get a D-. The real story of Jenkins Ferry is even more tragic. I think the early scene where Lincoln talks with some soldiers far fetched, almost dream-like. It was a clumsy way to set the stage even though it included the Gettysburg Address. I also found Sally Field as Mary Lincoln a poor choice. She did a good job acting the part, but she is literally too old for the role. Mary Lincoln was nearly 20 years younger than Sally. Even Hollywood make-up couldn't bridge that gap. I think her mental anguish would have been even more compelling if they had cast a younger actress. Although he appears very briefly, I thought the actor they picked for Robert E. Lee was too heavy even though his face looked very much like Lee. Jared Harris on the other hand was a dead ringer for Grant. I liked how the movie showed the close and trusting relationship between Grant and Lincoln, and Seward and Lincoln. Overall, I believe it is a must-see movie for all Americans and any others that wish to understand the civil war and our government better. My mom wanted to see the movie, but like me, she can get obsessed with projects. So she stayed home to finish the drapes and bunting for the road show. They are almost ready. We'll post more about them later. The next ACWRR Road Show work session will be 1 December starting at 1300. At this session we plan to install the foam terrain, roadbed. We also need to finish the framing for the staging section including devising a means to secure the front panel so that it is removable. Then we will paint the fascia, valance, and perhaps the base coat on the backdrop. In the meantime my mom and I will be working on the curtains to hide the legs and a patriotic red, white and blue bunting for the front. The bunting was Marty's idea. I think it will add a nice touch to the layout. My mom is visiting the next couple weeks and she brought her sewing machine with her. Also at this session we will assess the lighting and decide if we need to take steps to adjust the colors of the light. 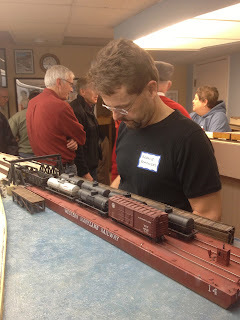 The recent Narrow Gauge convention in Seattle featured the debut of the Hangman Creek Narrow Gauge display layout. It won Best of Show at the convention. Here is a link for more information about it. Our project is much smaller in scope, but the two layouts share many ideas in presentation style. Last weekend Gerry and I were discussing the potential layout expansion, which is at this time a mostly hypothetical exercise. I mentioned this a few weeks ago on the blog and showed two possible designs. 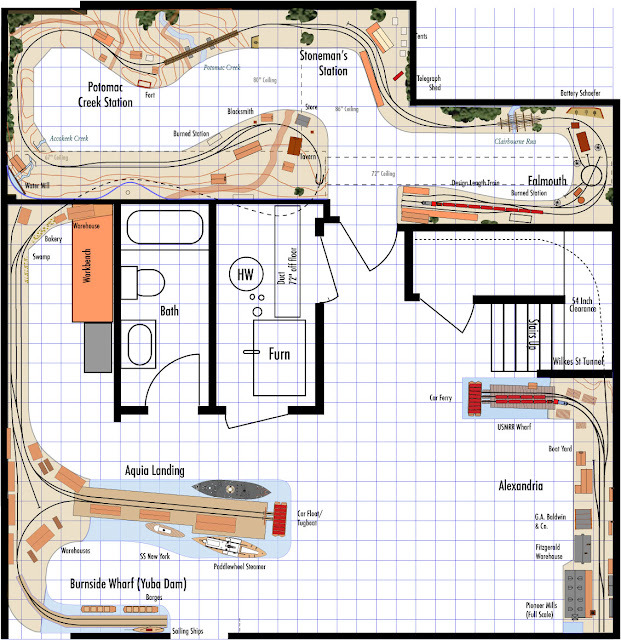 One focused on Alexandria and the other expanded the Aquia Landing portion of my current layout. Gerry is an advocate of the Alexandria expansion. If I heard him right he believes this design would add variety to the layout and provide an interesting switching operation. It is true that Alexandria waterfront would provide the opportunity to build an urban scene. I am not convinced that the switching would be that interesting. The more I thought about it, the more I realized that the most important and predominant job would be the switching the car float. But that is just the reverse of the operation at the main wharf at Aquia Landing. There are one or two other industries that could be worked in Alexandria. But it really isn't more than one crew to handle. Another issue that makes me uncomfortable is that I don't have any reference material describing how the USMRR actually worked the Alexandria waterfront. I suspect that it was a local switch job served mostly by the former O&A yard at Duke and Henry streets, with occasional interchange with the AL&H yard at Oronoco Street. Recognizing that the car float is the main operational feature, I redesigned the Alexandria layout by shrinking it and focusing on the car ferry operation. In this plan there would be two other industries to switch- the quartermaster warehouse in the old foundry, which was the location of the former Alexandria Locomotive Works, and a team track in front of (or is that behind?) Pioneer Mills. One cool aspect of the Alexandria the plan is that it uses the area under the stairs to make the Wilkes Street tunnel active as a staging track. How many waterfronts have a tunnel one block from the water? Convincing my wife about adding another hole in the wall is a different story. I did some rearranging of the buildings to place the biggest structure in the far corner. But the plan does include an "urban canyon." Gerry suggests I put this up to a vote to the blog readership in the spirit of recent election in the US for our next president. So what do you say? You don't have to be a US citizen to vote. Just look at the previous plans on the earlier post and pick which you like best. Try to describe why you prefer it. Feel free to introduce alternate ideas if you wish. It's a relatively open slate. color difference. It is not as noticeable to the eye, especially with overhead lights on. I installed the LED strip lights to the inner edge of the valance over the past two days. They work well. I used two strips on the narrower sections and three strips on the widest section. After installing them, I noticed that the second strip I installed is not the same color light as the first. I ordered only cool white lights, but it looks like I got one of each. For now I'll live with it. But I may have to go back and swap some of the strips to allow each section to have similar colored light. The issue that some have noted with LED strips of light spots reflecting off the rail tops does not seem to be a problem. It may be a function of the relative angles of the lights and rail. We tried a clear, patterned diffuser, but it didn't enhance the lighting. It was also very difficult to cut without cracking. So we opted not to use it. The mock-ups show how quickly O scale models fill up the layout space. If you convert this 29 feet long layout to N scale it is equivalent to a 6 inch by 4 feet layout not counting the staging. Gerry came up for a work session Saturday and we worked on finishing the bench work for the Road Show. First we tried different combinations of valances and supports. Once we decided on a path, another trip to Home Dept was required to pick up the necessary supplies. We decided to use 1x2's and 1/2x2's for the valance framing. This made it strong enough that one can lift the sections by the valance without damage. We used tee nuts and 5/16th inch bolts to connect the sections. So there are no clamps needed. The sections are fairly light, about 5-10 pounds with folding legs and valance. We did not use any exotic materials in the construction. Mostly kiln dried, premium pine lumber, quarter-inch plywood and eighth-inch masonite. Each section can be lifted by one person, though two people make it easier as they are a bit bulky. We are glad we kept them to four foot lengths. Gerry and I were discussing the fixation some have on light weight construction and we both believe that it can be taken too far. Stay away from three quarter inch plywood and you'll be fine with regard to weight. The sections have integral folding legs with diagonal braces. Most of the sections have one set of legs, except the big end section and the bridge section. Gerry plans to work on the bridge section at his house, so he wanted it to be able to stand on its own. To assemble the road show layout, the only tool needed is a 1/2 inch wrench. If you are in a hurry, a 1/2 inch socket in a power drill speeds things up. It should not take us more than 15 to 30 minutes to set up. On Sunday I finished adding the valance and fascia. It is now ready for the next steps - lighting and the foam terrain. On a separate subject, I received a notice from Google that my photo quota has reached its limit. So you may find some older photos missing as I go back and purge some images. It's been a busy time so no work to report on the rail gun, home layout or Road Show. However, I did come across an interesting diorama that I thought would be appropriate to share on this blog. It depicts a scene from World War II showing the Allies harbor in Cherbourg, France. It is built about HO scale with 1/72 to 1/96th scale models used. It is a massive project built by a club with members from Belgium. Check it out. We are having an ACWRR Road Show work session this weekend, so hopefully there will be progress to blog about soon. If you are in the neighborhood and want to check it out or help out, drop me a line. We made it through Hurricane Sandy with no damage. Our power flickered a few times, but it stayed on. Our sump pump was working nearly continuously and it did its job. We have battery back-up on the pump, but I am thinking a generator might be a good investment. Without that pump, the basement and layout would flood. Since I don't have enough to do, I added some more projects to my do list. The first is a model of the Lee-Brooke Railway Gun in 1:32 scale to match the Dictator mortar model I had made previously. These two models will be on display at the B&O Railroad Museum next year. The Dictator is done, but the Lee-Brooke Gun has to be finished in a few weeks. I plan to document the Lee-Brooke Gun construction in more detail in my book, but I posted some in-progress shots here. This is a tricky project as only two photos exist of this gun and many details are not visible. 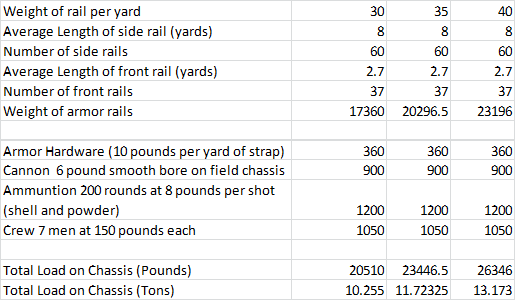 Dr Dave Schneider, of SMR Trains, did a good job of researching the gun and some of its construction details, but there are still many unanswered questions. 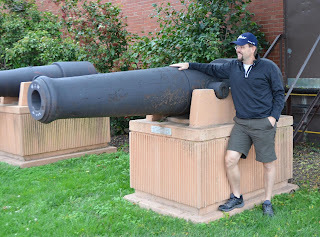 I was able to get good measurements of an existing rifled and banded Brooke 32 pound 57 cwt cannon at the Navy Yard in Washington. I machined the model gun from brass rods. The main tube, trunnions and knob are separate pieces. Being brass they were easy to solder using my torch. Using the gun dimensions and the rail gauge visible in the photo, I was able to scale most of the other dimensions of the model from the photos. I concluded that the plans in Alexander's book, while very good for overall proportion are off by about 50 percent. He assumed that the wheels are 33 inch wheels. But they are smaller, probably closer to 26-28 inches. I used 42 inch O scale wheels from NWSL (thanks are due to Derrel and Linda at NWSL for the rush job in shipping the wheels to me.) These scale out to 28 inches in 1:32nd scale. I machined axles out of iron rods. The trucks are laser cut wood and plastic. I used photo etched brake parts from my O scale cars to fabricate the brakes for the rear truck. Trucks and frame before decking. I decided to make all the wheels on pivoting trucks based on the truss rod patterns on the side frames. They indicated to me that the front truck was similar to the rear two trucks. It is moot since in normal viewing, you really can't see the trucks. I also added the truss rods on the frame even though they are not visible from above. It should be noted that this car has no evidence of longitudinal truss rods. I suspect that the lengthwise planks as well as the heavy wood framing for the ironclad casement also serve as the the longitudinal stiffeners. I originally added longitudinal frame blocking, but removed them after reconsidering the location of the truss rods. I probably should have added two lengthwise beams and used transverse blocking. Oh well. I will change that the next time I do it, maybe in O Scale. The gun carriage was really a dilemma, as I could find no other cannon with a carriage like this one. It looks to me that they took a seacoast casement carriage from a fortress and modified it to fit. 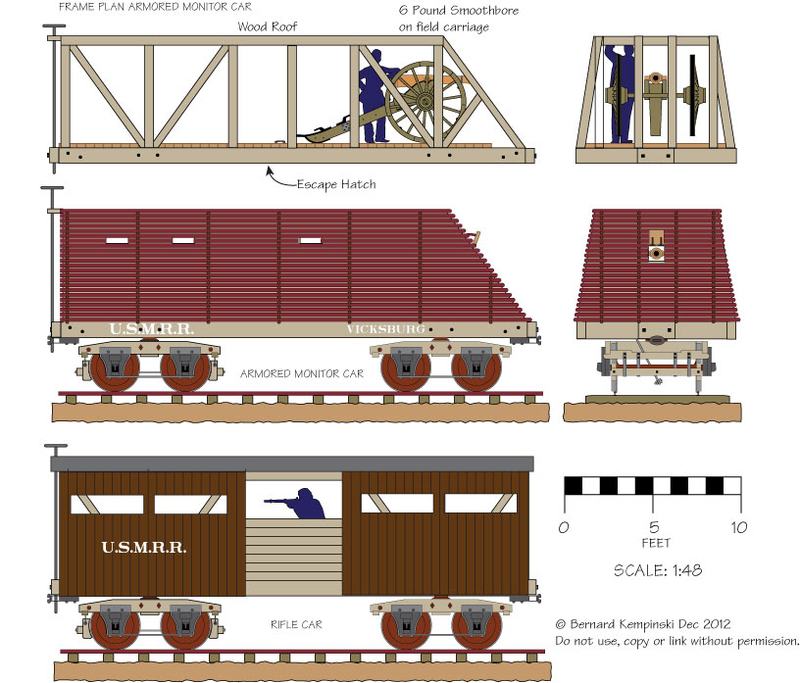 It appears to be a cross between the casement carriage (Plate 10 US Army Ordnance manual) and the carriage for flank casements (Plate 11 US Ordnance manual). But many of the visible details don't match either of those guns. 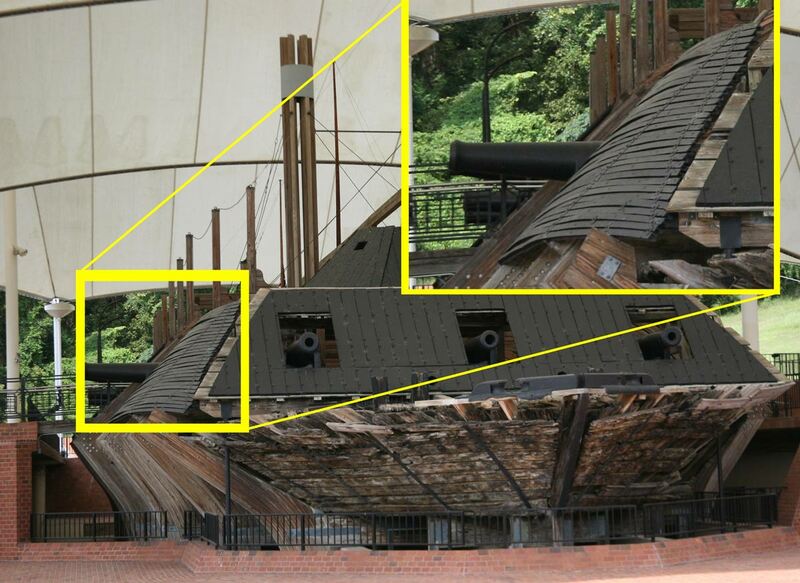 The number of steps on the side walls, the screw elevation and the type of gun are different. The Plate 10 carriage is close but there is no tongue on this gun, and the wheel tracks on the rails are different. In fact, the wheel tracks are not visible in the Lee-Brooke Railway Gun photo, but I assumed they are there and hidden by the view angle of the photo. So the approach I took was to copy all the detail that I could see and then did a little imagineering for the rest. Based on the angle that the carriage rails sit on, I suspect it may have some type of pintle giving it a limited traverse. I plan on adding that feature. Given the dearth of information, any suggestions would be appreciated. Hurricane Sandy is bearing down on the Mid-Atlantic and we are all standing by hoping it will spare us. With our storm preparations complete, I thought I would do a blog post to catch up some loose ends. Last month I did a quick scratch build of a simple cook house for the tavern scene. The idea for the cook house came from some books I borrowed from Gerry Fitzgerald about vernacular architecture. In particular the book, Back of the Big House: The Architecture of Plantation Slavery (Fred W. Morrison Series in Southern Studies) was very handy. I based my building on a similar structure from this book. This building houses a kitchen and servants quarters. The servants were likely slaves before the Union Army arrived. The building is now being used by the Army as a kitchen and Quartermaster office. I used Tichy windows and scribed siding. The roof shingles are laser cut red cedar with self-stick adhesive. The chimney is a simple scratchbuild from sheets of brick paper over a wood core. Due to the steep hillside, I had to install the building on wooden pilings. To complete the tavern scene I will also add a well house, cold cellar, hitching post and other details. I started adding some fencing, but more of these will be required. I also need to paint the backdrop in this area. Yesterday I received in the mail and package from John Brazaitis containing 6 O scale figures. He purchased these figures from Edwin Alexander near forty years ago. This is a real treat for me, because about 20 years ago I purchased a copy of Alexander's book, "Civil War Railroads and Models." I saw it on the discount table at Crown Books (now defunct) and purchased it. Since then I have studied and examined this book endless times so that the binding is worn out and the pages are coming loose. In large part it was my inspiration to try some Civil War Railroad modeling. So I am very grateful to John for sending me these figures. I look forward to painting them and adding them to a prominent place on the layout. Lets hope we have a home and layout to come back to after the storm passes over.